The Liliacaeae sensu lato (i.e., in the broad sense) are our most typical monocots. They are most often perennial herbs bearing leaves that are alternately arranged, simple in complexity, and linear with parallel veins. The flowers are in most instances bisexual (i.e., perfect, also known as hermaphroditic), large and showy. They are most often polypetalous (i.e., with separate petals, also termed “choripetalous”), and hypogynous. 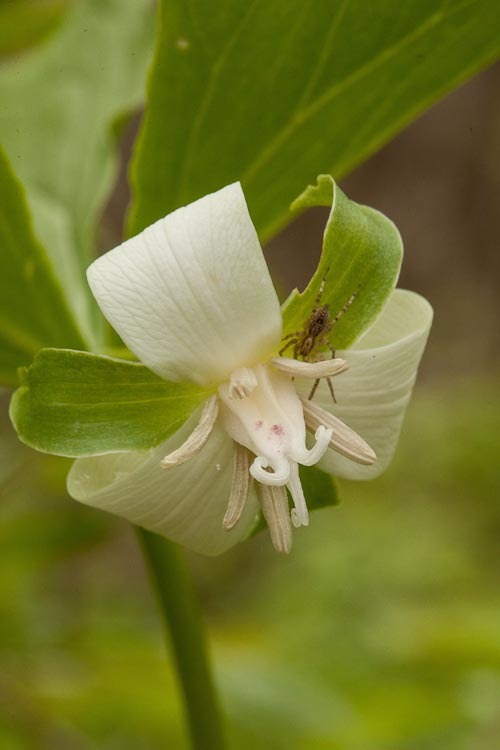 The flowers are 3-merous with sepals and petals that are identical (except in Trillium, which has green sepals) so that there are 6 “tepals” all of which are colorful and petal-like. The androecium is composed of 6 stamens, and the gynoecium of 3 united carpels. 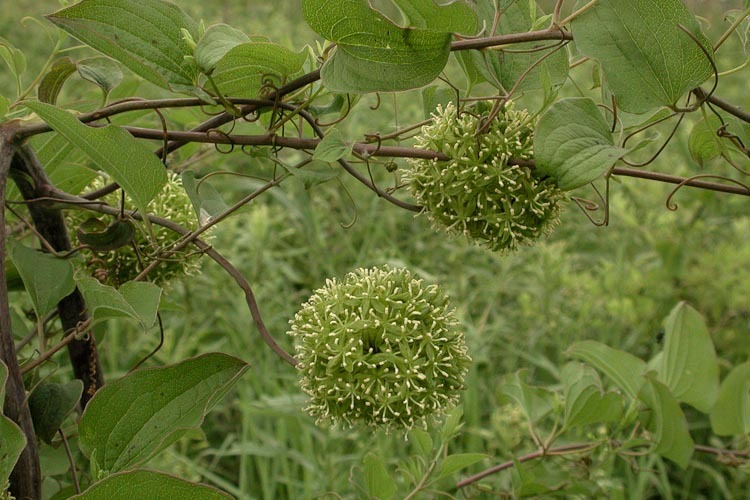 The fruit is a 3-locular (i.e., 3-chambered) capsule, or a berry. 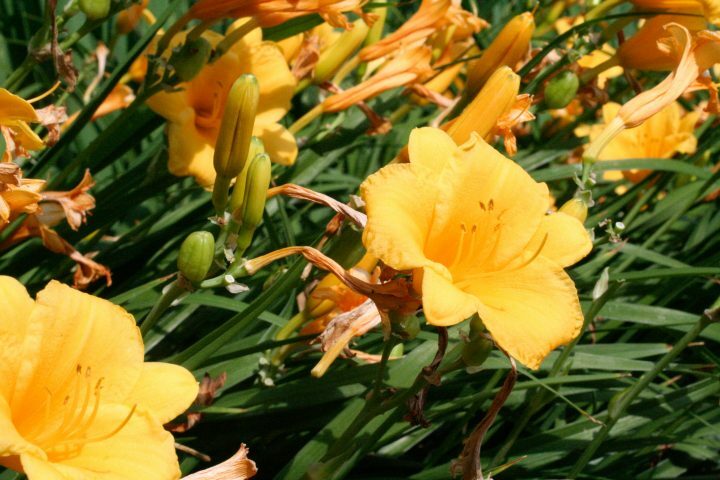 In addition to numerous types of lilies used widely as ornamentals, this group of families includes asparagus, sarsaparilla, saffron, onions and garlic. The several species of Aloe, which includes a popular succulent houseplant, are well-known as herbal remedies for skin ailments, especially burns. Meadow saffron is the source of colchicine, a chemical widely used in experimental agriculture to interfere with spindle formation in cells so that the chromosome number of plants may be artificially increased. Polyploid plants are often larger and more vigorous than their diploid relatives. Liliaceae, sensu stricto (in the narrow sense). Traditionally a rather large and diverse family, the Liliacae has now been divided into a number of smaller families. 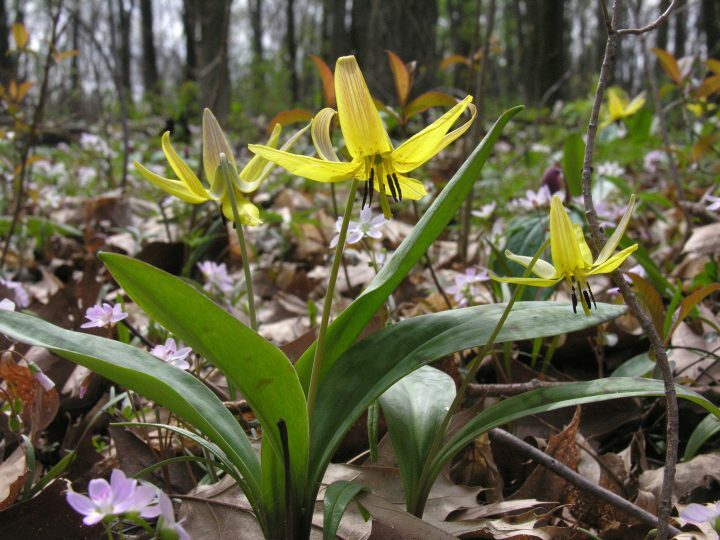 In Ohio, there are only two genera in today’s trimmed-down Liliacae: Lilium (lily) and Erythronium (trout-lily). 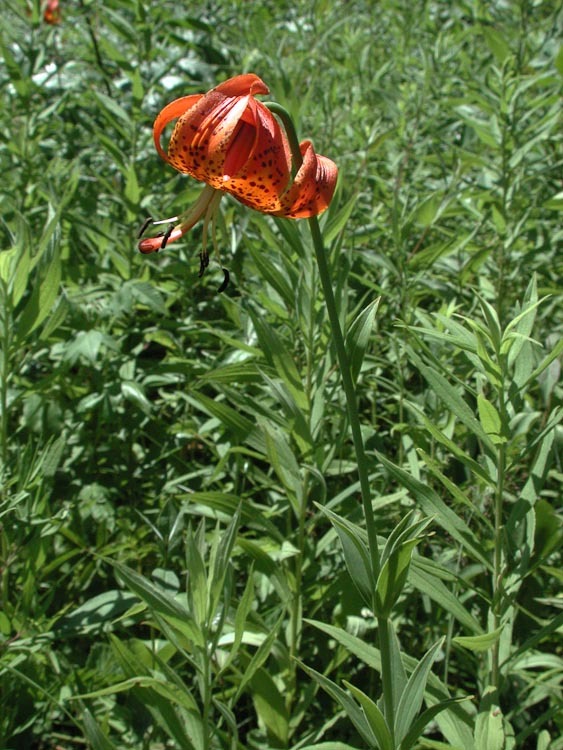 Michigan lily (Lilium michiganense), is a dramatic prairie and open woodland mid-summer wildflower that produces huge orange blossoms atop stem bearing several widely spaced whorls of oblong leaves. Michigan lily is a robust prairie wildflower. Lily flowers demonstrate well the perianth feature wherein sepals and petals are both present (3 of each), but they are all colorful, petal-like, and so similar that they are all designated “tepals.” See also the 6 stamens. 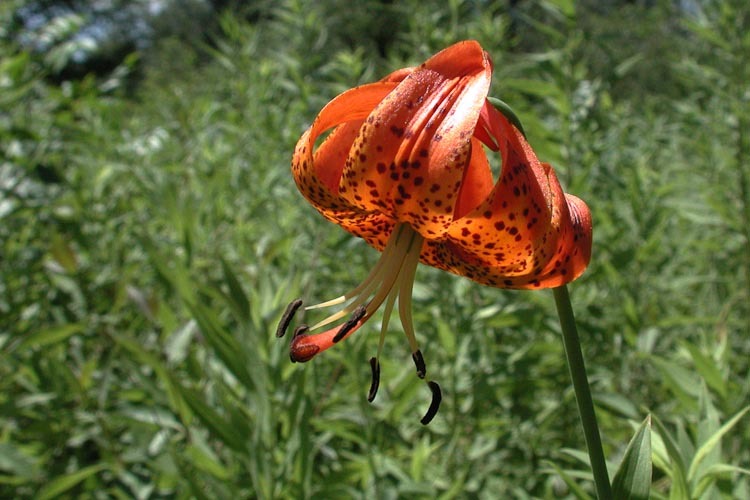 Michigan lily flowers have 6 “tepals” (sepals and petals all petal-like). Trout-lilies (a.k.a. dog-tooth violet, genus Erythronium) are distinctive even when there are no flowers. Their leaves, often abundant on the forest floor, are cheerfully dark-mottled. 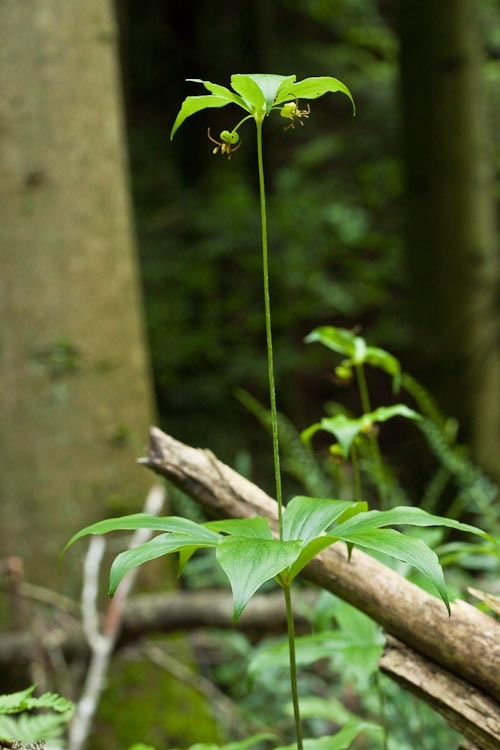 The trout-lily flower is solitary, atop a leafless stalk thus constituting a SCAPE inflorescence type. 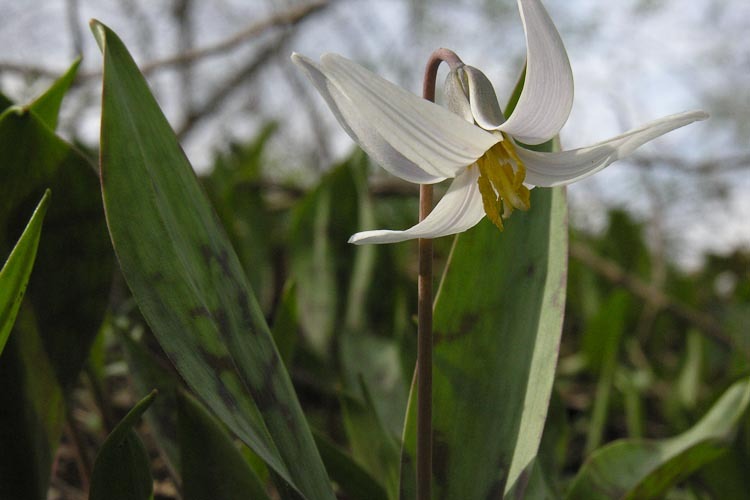 There are two common Erythronium species in Ohio, distinguished mainly by flower color. Here’s the yellow one, E. americanum, It has a northeastern distribution, and is found in moist woodlands. Yellow trout-lily is a scapose perennial woodland herb. The white one, Erythronium albidum, can be seen in prairies and other open areas as well as in moist woodlands, sometimes right alongside E. americanum. White trout-lily is a scapose perennial herb of moist woods and prairies. There’s another difference between the two: the shape of the styles: straight in the yellow one; curved outward in the white one. Left: Erythronium americanum has straight styles. Right: E. albidum styles are recurved. Like those of many Liliacae, the trout-lily fruit is a capsule. 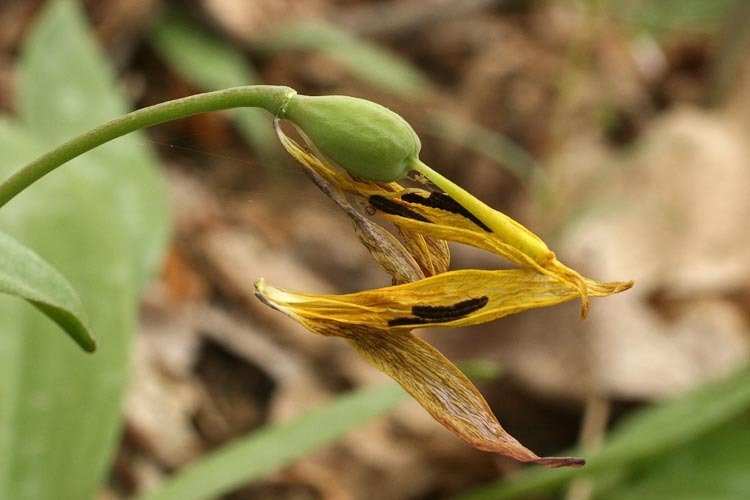 The trout-lily fruit is a capsule. Agavaceae, the agave family. Yucca plants are amazing! 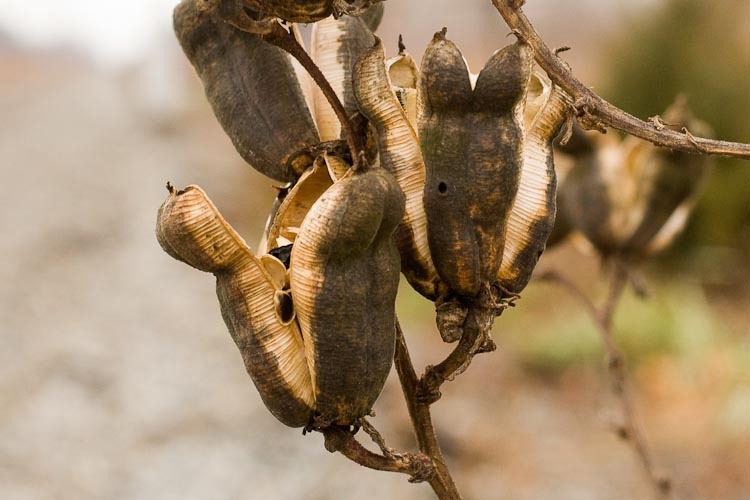 Native to the Atlantic coast, they’ve escaped from cultivation and thrive along railroad tracks. 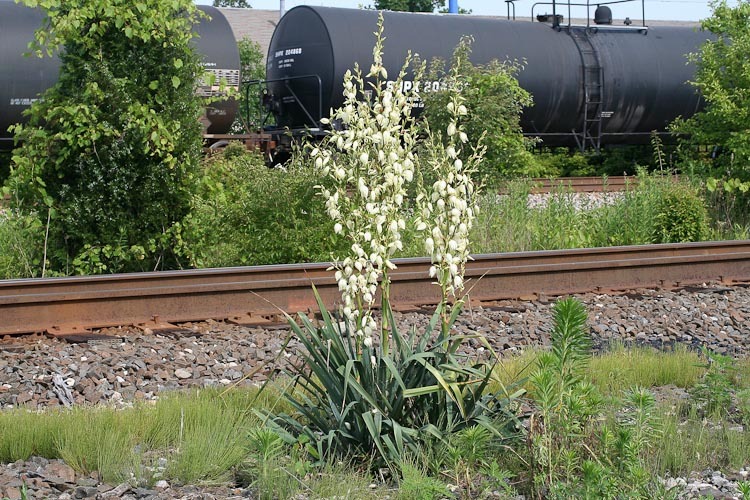 Yucca plants thrive in dry stoney places such as railroad tracks. 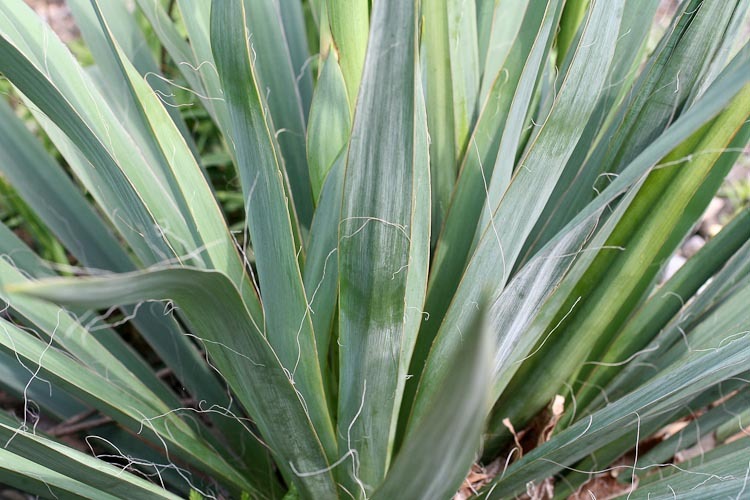 Yucca leaves are leathery, displaying well the typical monocot narrow shape and parallel venation. The flowers of yucca are pollinated by small moths that also lay their eggs in the flower’s ovary. The larvae develop within the ovary, consuming some, but not all, of the seeds. 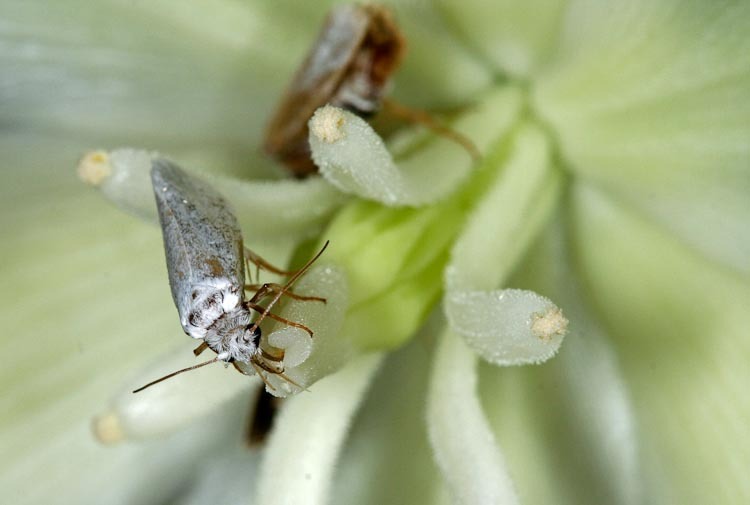 Yucca moth pollinating yucca flower. The yucca fruit is a many-seeded capsule. Yucca, fruits. Note the moth larva emergence hole. Alliaceae, the onion family. 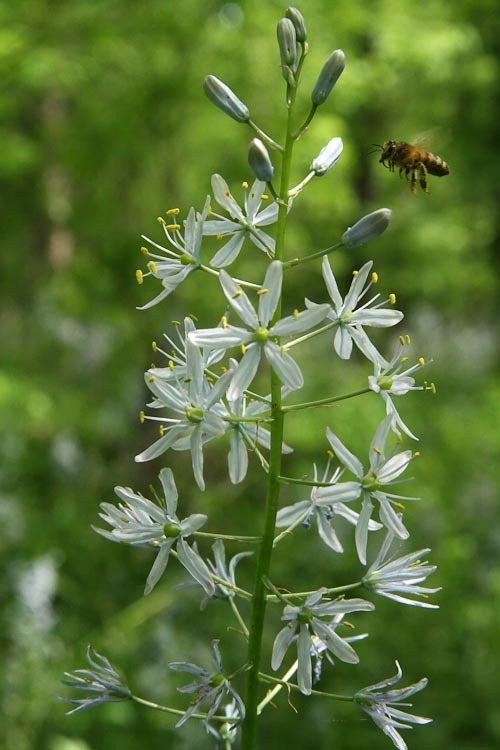 There are several species of Alium (onion) in Ohio. One of the most distinctive and common is wild leek (also called “ramps), a choice wild edible for making soups and stews. If you collect some from the forest, be careful there are no children around. It would be very awkward if they were to see you taking a leek in the woods! Wild leek is distinctive even without flowers as the shiny broad strap-shaped leaves are all over the place. Wild leek is distinctive even without flowers. 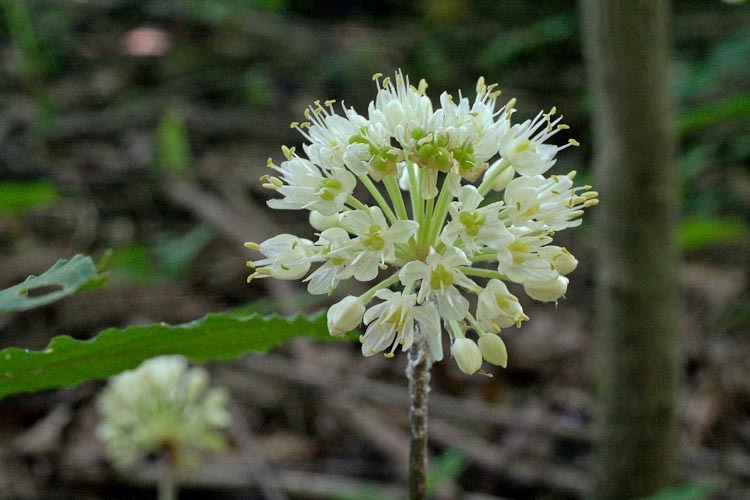 Wild leek flowers are small and white, arranged in upright umbels. The fruits are tiny bead-like capsules. Wild leek flowers are small and white; the inflorescence is an upright umbel. In more open places such as prairies and roadsides, another onion is rendered distinctive because of its nodding umbel: nodding wild onion, Allium cernuum. Bumblebees seem to like visiting flowers that require them to hang upside-down. Here’s a video of some bumblebee visits to nodding wild onion. Bumblebees visit nodding wild onion. Convallariaceae, the lily-of-the-valley family. 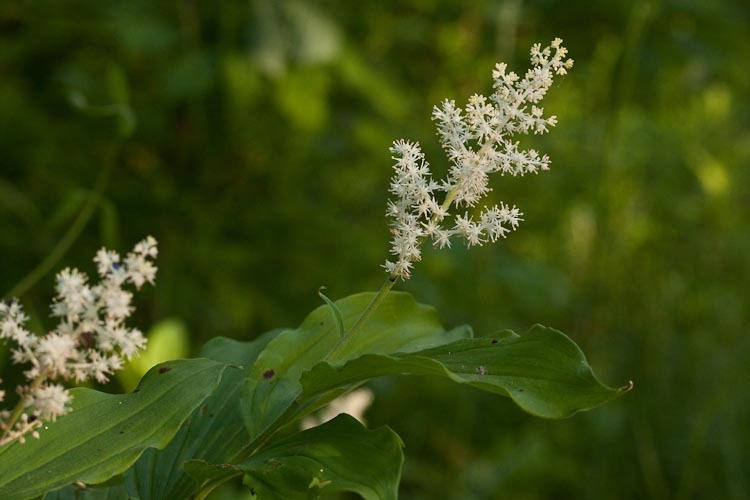 One of the most common, abundant and distinctive woodland wildflowers has the somewhat undignified name “false Solomon’s seal,” owing to a resemblance to another nice woodland wildflower. This is Smilacina racemosa (in older books anyhow; nowadays it’s being called Maianthemum racemosum). Notice the long arching stems with large elliptic leaves, alternately arranged, and very small white flowers in a terminal panicle. 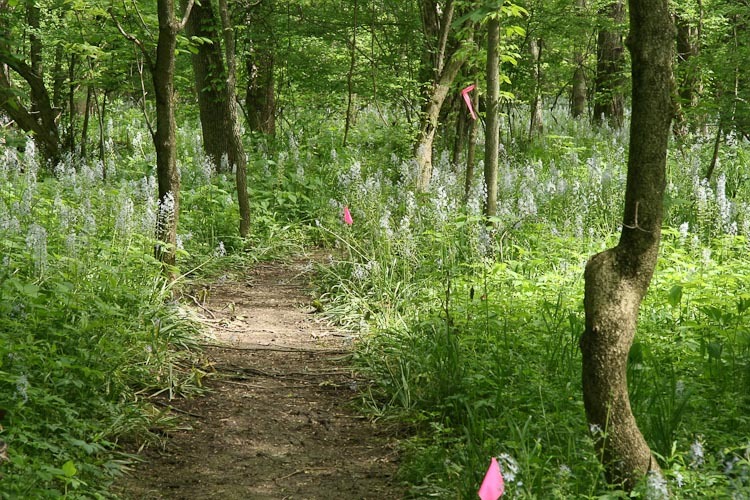 False Solomon’s seal is an abundant forest wildflower. 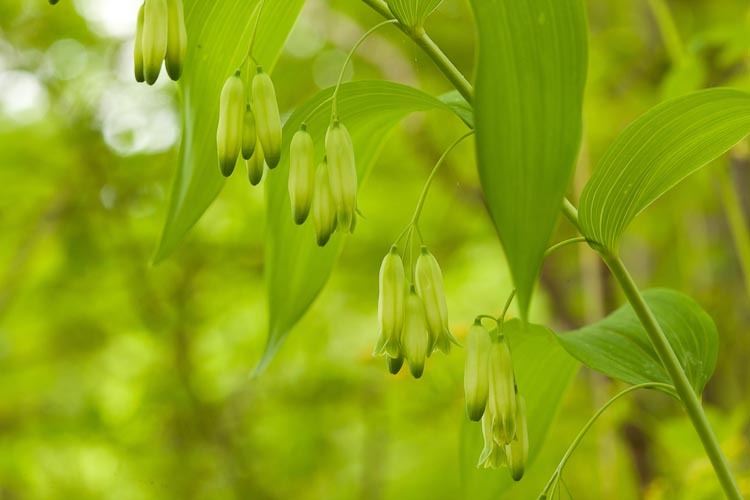 Here’s the real deal, Solomon’s seal, genus Polygonatum. It’s called “Solomon’s seal” because the underground rootstock is patterned with remnant leaf bases in a manner that apparently looks a whole lot like the old-time gadgets used (by Solomon, I suppose) to press wax onto the envelope-flap when sealing a letter shut. Solomon’s seal flowers are in axillary few-flowered clusters. 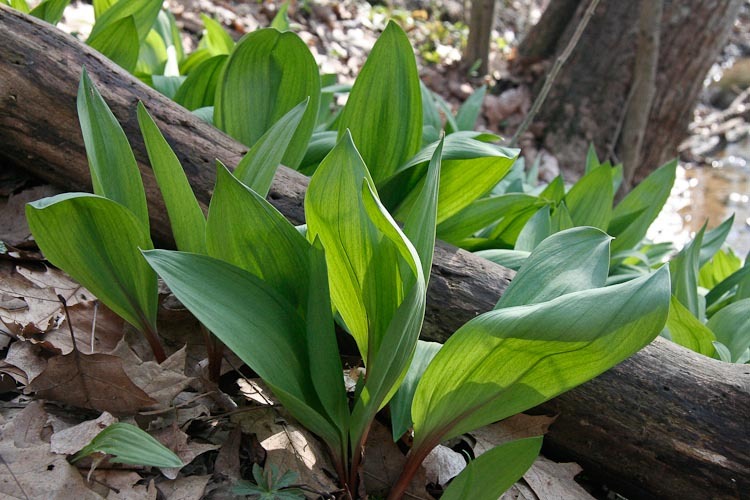 This particular species is Polygonatum biflorum, which is found both in woodlands and moist prairies. The Solomon’s seal fruit is a berry. Solomon’s seal flowers are in axillary clusters. Indian cucumber-root, Medeola virginica, is woodland wildflower that produces two tiers of whorled leaves on a wiry upright stem. Indian cucumber-root produces two tiers of whorled leaves. The upper whorl includes a few flowers. The Indian cucumber-root flower has a set of three strikingly elongate styles. The species seems to be pollianbted by pollen-gathering bees. In the photo below, see a bee gatherinf pollen from an anther, and, a moment later (MOUSEOVER), landing on the elongate stigma of a neighboring flower. MOUSEOVER the IMAGE to see BEE LANDING ON STIGMA! Pollen bee gathers pollen from anther. 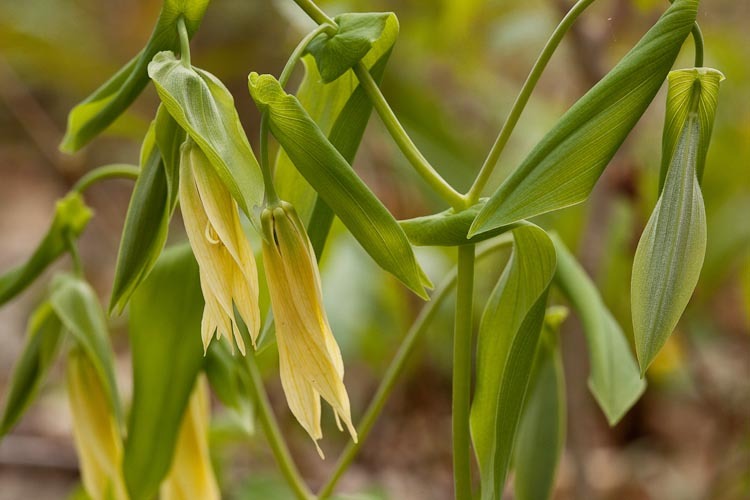 Large-flowered bellwort, Uvularia grandiflora, is a fairly large woodland wildflower with flowers with long drooping tepals that look remarkably leaf-like and so could be passed by without being noticed. Large-flowered bellwort has perfoliate leaves and large drooping flowers. 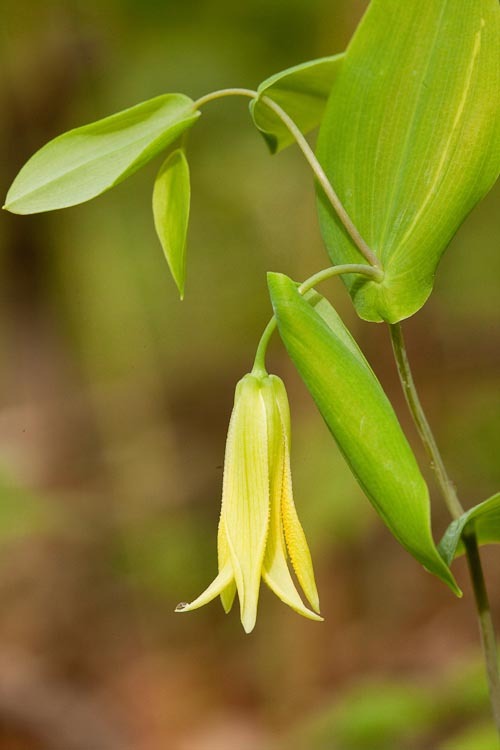 Like other members of the family, bellwort flowers are composed of 3 sepals and 3 petals that are all colorful, 6 stamens, and a syncarpous gynoecium of 3 fused carpels. six “tepals,” 6 stamens, and a 3-carpellate gynoecium. Here’s another bellwort species that shows very well the “perfoliate” leaf form wherein the leaf base wraps around, and is fused with, the stem, so that the stem appears to have grown through the leaf. Perfoliate leaves encircle and are fused with the stem. Hyacinthaceae, the hyacinth family. Wild hyacinth, Camassia scilloides is a bulb-forming woodland and prairie perennial herb that is sometimes very abundant. Wild hyacinth blankets the forest floor. Wild hyacinth is a good example of a “raceme” inflorescence type: elongate, indeterminate (with younger parts at the tip), and the individual flowers stalked. Note also the linear leaf-like “bracts” subtending each flower. The wild hyacinth inflorescence is a raceme. Smilacaceae, the carrion-flower family. 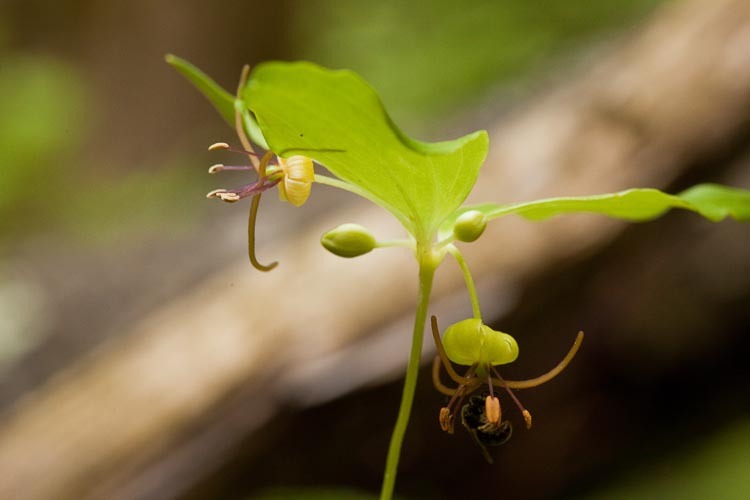 The genus Smilax includes an interesting prairie herbaceous vine, carrion-flower, Smilax herbacea, that departs interestingly from the usual lily pattern by being diocious, i.e., having separate male and female individuals. Here’s a male individual carrion-flower. Carrion-flower is a diocious vine. 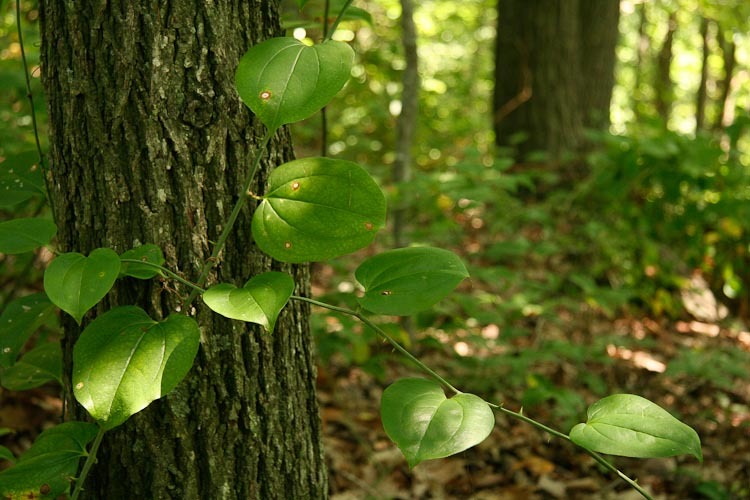 Other members of the genus Smilax display an even greater anomaly in that they are woody! This is quite unusual for a monocot. (Ohio’s only other woody monocot is bamboo.) These are the greenbriars, quite spiny lianas (woody vines) that are quite annoying for anyone except maybe Br’er Rabbit. Greenbriar is a pain to walk through. Trilliaceae, the trillium family. Trillium is an extraordinary genus, especially show, and different from other members of the lily family in that the sepals are green. 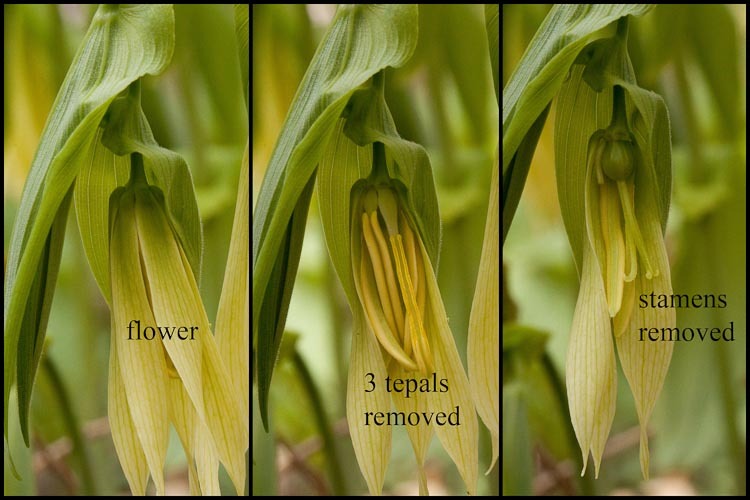 They look like sepals…there’s none of this silly “tepal” stuff. 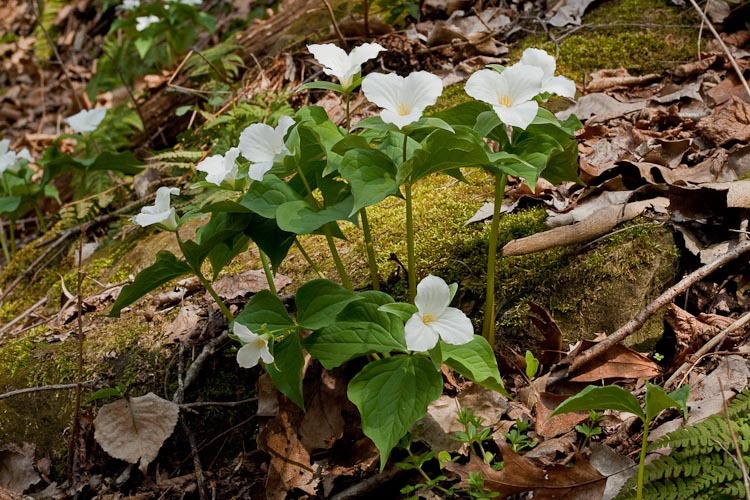 One of the most common, conspicuous, and indeed popular trilliums is large-flowered trillium, Trillium grandiflorum. Large-flowered trillium is often quite abundant. 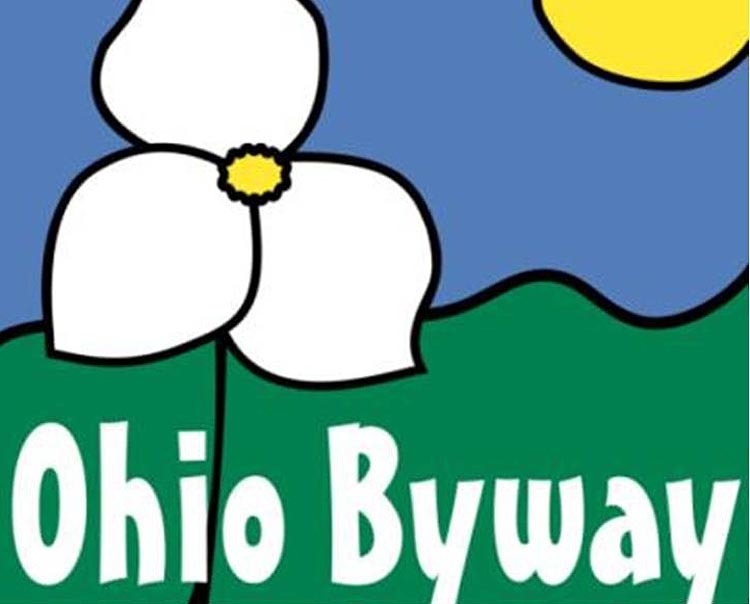 Large-flowered trillium is immortalized in Ohio’s signage for its scenic byways. Toadshade, also called “sessile-flowered trillium” (“sessile” means lacking a stalk, as these flowers do) is often common in the same moist woodlands as the large-flowered one. “Sessile” means lacking a stalk. 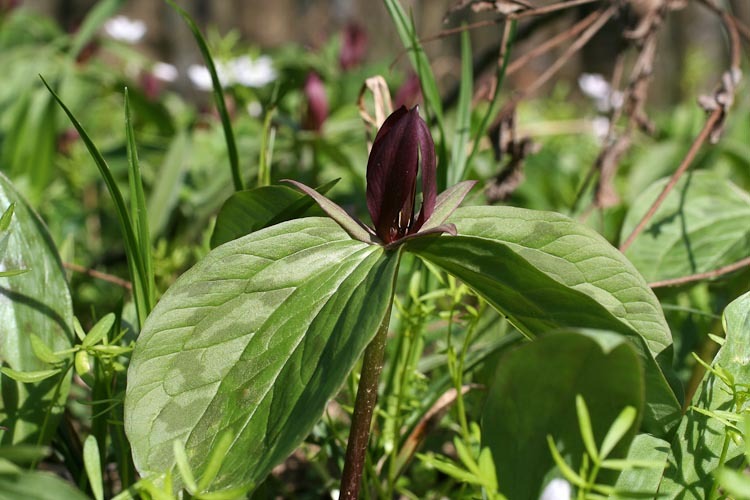 Toadshade is a sessile-flowered trillium. Careful observation in a woodland crowded with large-flowered trillium will sometimes reveal a few plants of a different, but quite similat species, noddong trillium, T. flexipes. Nodding trillium is occasional in most woods. Asphodelaceae, the day-lily family, includes the day-lily genus Hemerocallis. These are not native to Ohio and can be quite weedy, especially in prairie restorations or along roadside, spreading from cultivation. 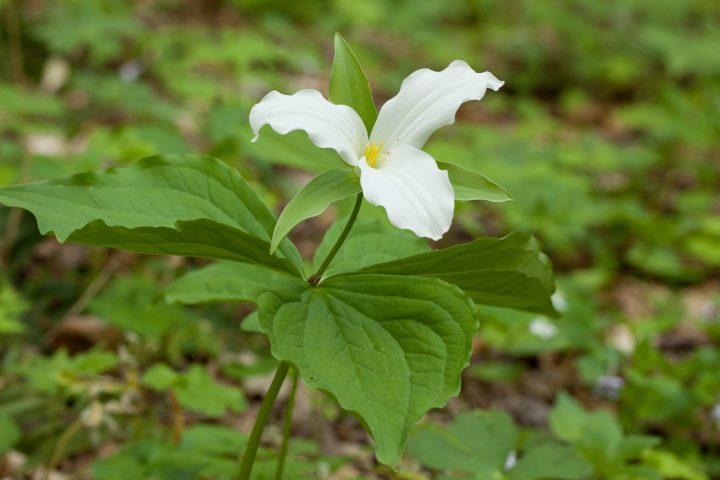 Large-flowered trillium, Trillium grandiflorum, is Ohio’s best-known wildflower. 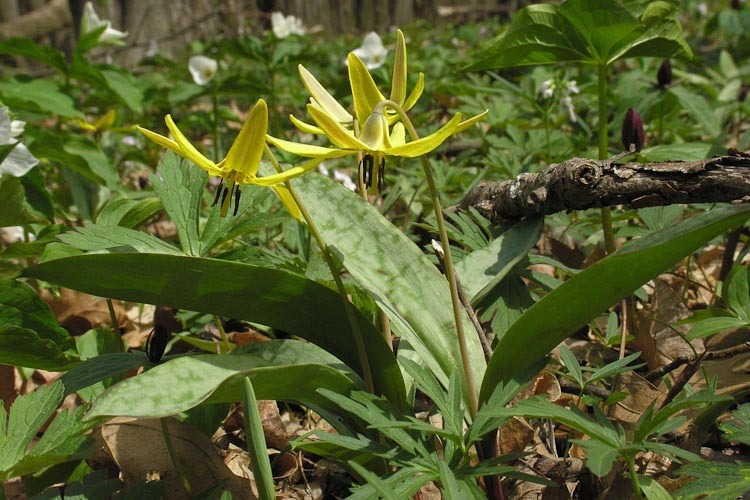 Yellow trout-lily, Erythronium americanum, is a beautiful and distinctive spring wildflower. Day-lily, genus Hemerocallis, can be invasive in prairie restorations and along roadsides.